And brought it through me. Fulfill that day’s promise 42 years later. The official name for this rock is the Great Stone Face (nicknamed Big Face Rock) because it weighs a staggering 104 tons and because it looks like the face of a man. It was brought to Wolmyeongdong in the fall of 2002. The Great Stone Face is an image rock of a person’s face. It has the clear shape of two eyes, a nose, and a mouth. Depending on the angle you look at the rock, you can spot different kinds of faces. However, besides the Great Stone Face’s impressive stature, this rock is special because of the story it shares with Pastor Jung Myung Seok. It is a story that happened over 42 years ago, a story Pastor Jung shares with the Lord. Forty-two years before he brought this rock to Wolmyeongdong–when Pastor Jung was just in his early teens–the Lord wanted to give this rock to Pastor Jung through the rock’s previous owner. In the end, the Lord gave this rock to Pastor Jung as a symbol of the story they shared. The Great Stone Face also compliments the Holy Son Rock, which was discovered in May 2012. When Pastor Jung was in elementary, on his way to church, he saw this rock in a middle of a rice paddy in Seongmak Village (close to where he lived at the time). Although it simply looked like an average large-sized rock whenever he passed by it, he noticed it was actually very big and flat. So he climbed on top of it. It was autumn at the time, so Pastor Jung was able to pick the persimmons from the tree growing next to the rock. During that time, he would also sit and play on the rock. From on top of the rock, he realized how different everything looked than from the ground. He felt like he was in a different world. It was magnificent, beautiful, and marvelous. Thinking about it now, Pastor Jung sometimes says that the rock seemed big and flat to him at that time because he saw it when he was young. He thought to himself that it would be nice to bring this rock home, place it in his backyard, climb on it, and play on it every day. After that day, on his way back from church, Pastor Jung would go up on that rock and stand there for a while before going back home. He went there even when there were no persimmons on the tree and also when the rice paddy’s owner was planting rice. Every time he passed by the rice paddy as he went to church, he fantasized with dreams and hopes that one day, he would take that rock. The rock was also used as a place where people could have a break from work, gather and have meals whenever the rice paddy owner’s wife brought food in a basket. At that time, the owner was working nearby. Pastor Jung was inspired to greet him. He went up to the rock where the owner was and told him that he really liked the rock, praising its beauty and stating it as the reason he came. The owner agreed that the rock was great, but he also mentioned that the rock bothered him whenever he plowed the rice paddy. If it wasn’t so big, he would have thrown it away. But as such, he just left it there. Pastor Jung said that one day he wanted to take the rock and place it in a field in Wolmyeongdong. Of course, at that time, the backyard of the straw-thatched house where he lived was so small that if the rock was actually placed there, there would be no space left! “Taking it is my responsibility,” Pastor Jung reassured him. The owner mused, “Well, if you took it, there would be more room in the rice paddy, so that would be nice.” The owner smiled and said that Pastor Jung could take it if he wanted. Pastor Jung still remembers the grin on the guy’s gentle face. He was a big and strong man in the village. After he heard that he would give the rock, Pastor Jung left saying that he was going to church. From that time on, Pastor Jung thought of the rock as his and thought of how he would dig it out. He was happy just imagining it every time he saw it. Since he gave his heart to the rock, a story developed between the two. He had no idea at that time that the Lord would make him like the rock and make the history that you see today. After that exchange, whenever Pastor Jung passed the rice paddy, the owner asked with a smirk, “Aren’t you going to take this rock? When are you going to take it?” He teased Pastor Jung, thinking that he would not be able to take it. Pastor Jung felt pressured by those words. The story even became a legend in the town because the rice paddy owner spread a rumor amongst the villagers saying, “Myung Seok from the upper village told me that he would take this rock, so It old him that I would give it to him if could take it.” Some villagers said that Pastor Jung was crazy and laughed at him. Other villagers did not care. Even when Pastor Jung himself thought about it, they just seemed like words that he blurted out at the moment. But later, he realized that they were words that the Holy Son spoke through him. The Divine Being always works in secret. One day, when Pastor Jung was 20 years old, he went to see the rock. He went when the owner was absent in case he would hurry him to dig it out and take it. It was truly a gigantic rock. He also wondered how much of the rock was buried underground. From the surface, it seemed like half the rock was indeed buried underground. But neither he nor the owner could have imagined just how much of it was actually underground. The owner said that sometimes it looks like there’s a lot beneath the surface, and sometimes it seems like nothing is there. No one would know until it gets dug up. As Pastor Jung looked at the rock, he pondered how he would take the rock. At the time, he never even thought about the equipment that was needed to excavate it. After he passed the age of 40, even when he began the construction of Wolmyeongdong and was going around Korea to look for rocks, he actually did think of the rock, but could not even dare to take it in its entirety. Before, there was another big rock as well, but they could not imagine moving the whole thing, so they broke it into pieces and got rid of it. Sometime later, when Pastor Jung was overseas, the placement of big rocks started in Wolmyeongdong again. He worked with the people in Wolmyeongdong by watching the construction site through videos sent through the Internet. The Lord told him that there was a big rock buried in the vicinity of the parking lot and that it should be dug out. Before, they never thought of moving such a large rock with a crane. In the same way, they could have never imaged that they could move the rock that became his when he was young. However, the Lord gave him the revelation and he immediately told his members to work on it. He supervised via the Internet and dug out some big rocks in the process, moving them all to Wolmyeongdong. Suddenly, he was reminded of the big rock in the middle of the rice paddy that he had set his eyes on from when he was in his teens. So he called and gave instructions to his younger brother Pastor Beom Seok. He asked his brother to remind the rice paddy owner of him and of his desire to take the rock since his teens. He told his brother Pastor Beom Seok that if he spoke to the owner, he could certainly take it because it was God’s Will. When Pastor Beom Seok went, the owner said, “If you can take it, that’ll be great. I should give it to him as I promised, since I like President Jung.” He said that he would give it to me as a gift, and he wished him well. He also asked that they combine his two rice paddies, which we promised we would, and we began the operation of taking out the rock. Pastor Jung watched the entire process through the internet live broadcast. From the surface, the rock looked to be about 70 tons, but when they dug it up, it actually weighed 104 tons! This was much heavier than expected. That is approximately the weight of 104 cars combined. The rock was so big that, after digging it out, it was difficult to take out of the rice paddy, and it was almost impossible to bring to Wolmyeongdong, which has an elevation of 400m2 and a steep mountain side. We couldn’t lift it with the 150 ton crane, so we loaded it on the 300-ton crane – the strongest one in Korea – and moved it, taking all kinds of risks. Loading it up onto a trailer, they brought it to Wolmyeongdong. While struggling up the slope, suddenly, the trailer slid backwards and the transmission broke due to the weight of the rock! Pastor Jung, who had been watching over the Internet, let out a loud shriek and called out to God and the Lord at the time. Thankfully, at that critical moment, the excavator driver stopped the trailer from the back with the excavator bucket, so they avoided a major accident. God truly worked miraculously by blocking it through the driver and back of the excavator! If the rock had fallen from the frailer, some people could have died. However, God and the Holy Son Lord truly showed a miracle by stopping the car. It was the greatest miracle that occurred while moving the 104-ton rock. Pastor Jung immediately asked a member on site to confirm whether people were not hurt, and asked about the situation. The member told him that the rock was too heavy to handle. He reported that hard the trailer couldn’t climb the slope because the rock was too heavy. He was at a loss of what to do. We put down the rock and sent the trailer back on that day. The next day however, we brought a bigger trailer and loaded the rock. They executed the operation like how the Holy Son inspired Pastor Jung, and miraculously, they were able to move the rock! The Holy Son protected them with His power, so that they were able to transport it all the way to Wolmyeongdong safely. It is common sense to think one level higher and take action if things do not work out even after you have tried them. If you use the same old method, it will not work. Until then, they had only moved rocks that weighed up to 80 tons. That was the first time that they moved a rock that weighed over 100 tons. The method that the Holy Son told Pastor Jung was the only way to climb up the slope from the parking lot. It’s about doing things at a higher level. Then it will work. Pastor Jung and the workers did it one level higher lifting the rock with a 300-ton crane to load it. They did it one level higher by using a bigger trailer to load the rock. But even this was not enough. So they pushed with a bulldozer from the back and pulled the rock with an excavator in the front to move it safely to Wolmyeongdong. The Holy Son said, “Listen to My words and see things one level deeper. Take action one level higher as you live your life of faith.” The solution is that everyone should listen to the words of God and take action. It is problem solving. If you just take action comfortably and complacently, you cannot raise your level. You must struggle and pray deeply, and do it until the end. The heart, mind, thoughts and the soul must become one and take action. The Lord prepared the Great Stone Face 42 years ago, already knowing its future. When they finally placed the rock on the sports field, they saw many images on the rock. The image of a turtle appeared on one side. One the other side, an image of a kind yet serious person appeared. Everyone said that it was mysterious and extraordinary and gave glory to God and the Holy Son. The rock fulfills the legend mentioned in the book called The Great Stone Face by Nathaniel Hawthorne. 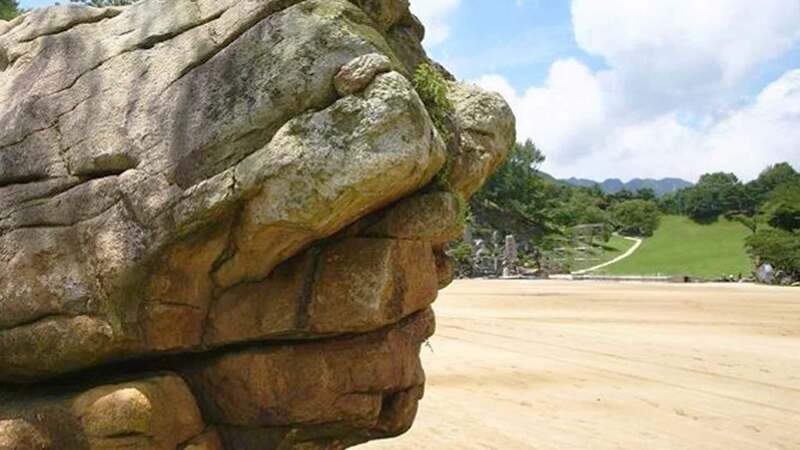 Pastor Jung named it the “Great Stone Face” because the face that appeared on the rock looked like him. Come to Wolmyeongdong and see this rock for yourself. It is truly a gigantic rock that is beautiful in its images, shape and size. But most importantly, it contains the deep story between Pastor Jung and the Trinity that spans more than 42 years.